On the eve of the 2018 NFL season there are more compelling reasons than ever to follow the sport, writes Pete Sharland. If you believe the tweets of the President of the United States of America, and this column strongly urges you against that in this day and age, you would probably say that the NFL is slowly dying if asked about the state of the league. Caught in a wave of controversies, and left in the wake of the NBA, many believe that this is the beginning of the end for America’s Game. Yet dig a little deeper and perhaps this is merely the start of something altogether different, a new period for the NFL, not quite a re-birth but perhaps a redevelopment. A new era that can help the league capture a new generation of fans. Off the pitch that is going to be easier said than done, plenty still needs to change, but on the pitch there are signs that something quite exciting is about to begin. Let’s start with the single most important position in the game, and perhaps in all sport: the quarterback. The position that demands so much and on so much hinges. 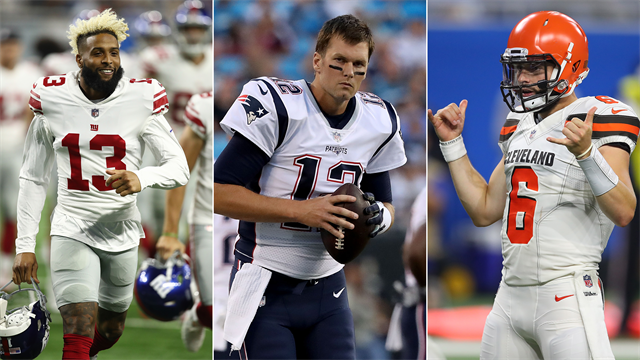 For a while it felt as if the NFL was going through a bit of a top-heavy quarterback stagnation, led by some true giants of the game, but often trying desperately to hide the horrible dearth of quality quarterbacks below the surface. In 2018 this could not be further from the truth. Tom Brady and Aaron Rodgers are geniuses, true freaks of nature, and right now two of the main favourites to win the MVP award. Their weapons have changed over the off-season but their ability to transcend everything else on the pitch, and change games single-handedly, is certainly not in doubt. At the other end of the age spectrum you have five first-round rookie quarterbacks entering the league in Baker Mayfield, Sam Darnold, Josh Allen, Josh Rosen and Lamar Jackson. Only one (Darnold) is penned to begin the season as the designated starter, but these young men will make their mark on the league sooner rather than later. A year into their NFL careers, big things are expected of Patrick Mahomes II and Mitchell Trubisky, whilst plenty of eyes will be on Deshaun Watson, who lit up the league last year before an ACL injury cut his electric rookie season short. And somewhere in the middle of this particular spectrum you have Matt Stafford, Cam Newton and the returning Andrew Luck. Dynamic playmakers who will have you off your seat each and every week. We haven’t even mentioned last year’s Super Bowl MVP, Nick Foles, who will be starting under centre when the Philadelphia Eagles start their campaign, with Wentz still working his way back to full fitness. Oh, and of course, don’t forget the devilishly handsome new face of the San Francisco 49ers, Jimmy Garoppolo. Was his stellar end to the season a mere flash in the pan? Or the rejuvenating force this franchise so desperately needs? Speaking of which, the issue of former 49ers quarterback Colin Kaepernick has to be raised. Kaepernick, who will be face of a new Nike campaign, has filed a grievance against the league and he, along with former team-mate Eric Reed, remains unsigned. There is much more to come from this story but Kaepernick remains an inspiration. He jeopardised his and his family’s future for what he believes in. He felt a conversation need to be had, and he has certainly achieved that. There are wider social issues that could take years to fix but Kaepernick has had a hugely important role in starting that process. From a purely football standpoint it is true that most teams have their starting quarterback locked in for the next few years. However there are notably a few teams who either could use his services now or who could have used Kaepernick in the past. That he and Reid remain free agents speaks volumes. Returning to the field and one of the most intriguing narratives this season is the sheer number of comeback stories across the league. We’ve already mentioned Rodgers, Watson and Wentz: the former two saw their teams collapse when they went down with injury. That’s not even considering the long-awaited return for Luck, one of the nicest men in football who deserves far better than his injury history. Away from the quarterbacks and there are more superstars returning from injury this season such as wide receiver Odell Beckham Jr, defensive end JJ Watt and running back David Johnson. Watt, the Walter Payton Man of the Year following his work raising money for the victims of Hurricane Harvey, has a pivotal role as the leader of the Texans defence and has a crown to reclaim. Previously the undisputed king of defensive players, Watt has since been usurped by Aaron Donald and Khalil Mack, now the two best paid defensive players in the league. He’ll be looking for that to change. However even Watt pales in comparison to Beckham when it comes to worldwide fame. Beckham’s ability as a receiver is only matched by his ability to make himself a viral sensation. Whether that’s with his one-handed catches or dancing in the changing room after securing his new contract, Beckham is must-watch TV. The NFL is doing its bit to sell the game to the rest of the world and players like Beckham are crucial to that. As the world of sport edges closer to a world of individuals rather than organisations it’s no surprise to see the NFL doubling down on their biggest personalities. For English NFL fans the trail blazer right now is Super Bowl champion Jay Ajayi, a destructive running back who will be looking to have an even greater impact after being traded to the Eagles from the Miami Dolphins last season. Perhaps this column's favourite storyline of the off-season though is that of Jordan Mailata. Born in Sydney of Samoan descent, 21-year-old Mailata this year became just the second-player ever to be drafted without any American high school or college experience. By his own admission he had minimal knowledge of the game before starting training at the IMG Academy but yet he was drafted by the Eagles and, quite incredibly, has made their 53-man roster. He’s one to certainly keep an eye on and at 6”8 and 346 pounds that won’t be a difficult task. Mailata’s tale is truly heart-warming and the NFL is full of storylines that will make you smile, despair and leave you wanting even more. Heck, we didn't even get to the return of Jon Gruden. It all comes down to 32 teams, 16 regular season matches and one defining match, this year to be held in Atlanta.